How to reach your ship from Nuremberg's airport and city center (or vice versa). Nuremberg (in German, Nürnberg) may be landlocked, but it's a popular cruise port. From the city's Personenschifffahrt quay on the outskirts of town, river vessels head west toward the Rhine (via the Main-Danube Canal) and east to the Danube. The cruise port is often mischaracterized as an "industrial port." In reality, it's a stretch of newly-paved waterfront with a pedestrian promenade, a bicycle path, and even a small beer garden with a forest behind it. On the opposite side of the canal, you'll see a handful of industrial facilities (such as a glass-recycling center) and a large, ultramodern fire station. From the clearly-marked ship berths on the quay, a short road and paved paths lead up a gentle hill to public bus stops. The simplest way to reach your ship, or to get from your ship to the city or Airport Nürnberg (NUE), is to let your cruise line handle the transfer. Some lines, such as Emerald Waterways and Scenic Cruises, provide free transfers for all passengers. Others provide transfers only for guests who have booked air and/or hotels through the cruise line. Another option is to hire a taxi. Although cruise forums are replete with complaints about cab drivers who aren't familiar with the port's location, most drivers should be up to speed by now. You can make things clearer by including the words "Am Main-Donau-Kanal" when you give the driver your destination. A third possibility (and the approach described in this article) is to use Nuremberg's excellent VGN public transit network. From the city's main railroad station or Nuremberg Airport, you can easily reach the cruise port via U-Bahn train and the No. 67 city bus. Transit fares are cheap, and travel time is quick: On a weekday, for example, you can get from the airport to the port's bus stop in about 46 minutes, including a transfer between U-Bahn and bus. From the railroad station, the trip is even faster: 18 to 26 minutes, including the transfer. For step-by-step illustrated directions to and from the cruise port, see the following pages or browse the menu below. We've chosen the simplest routings (which aren't always the fastest) to minimize transfers and mistakes. If you don't mind multiple transfers, you can research your own itineraries at the VGN Web site. Do not rely on satellite imagery in Google Maps, Bing Maps, etc. for directions to the port. 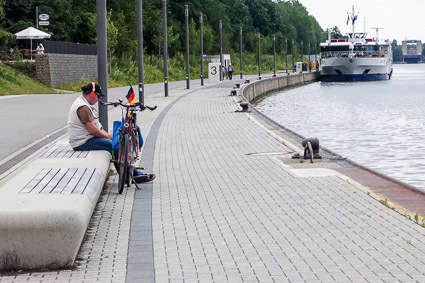 Nuremberg's cruise port has undergone improvements and expansion in the last few years, and satellite photos were out of date the last time we checked. For an alternative set of directions, see this reader report.